According to sources close to the situation, Yahoo paid $60 million to $70 million for social browser startup Rockmelt, with an aim of using its technology to turbocharge its myriad of media and mobile properties. The ambitious company, backed by Silicon Valley’s top players, had not gained as much traction with its desktop browser as had been hoped since it launched several years ago to much attention, so presumably a link with the Internet giant will give it a new energy. Sources said that Rockmelt has been focusing its attention of late on its mobile efforts and this engineering will become part of Yahoo’s own efforts in the area. The deal is not much of a win for investors, who pumped close to $40 million into what was essentially a moonshot effort to compete via differentiation with major browser powerhouses, including Google Chrome, Mozilla’s Firefox and Microsoft’s Internet Explorer. Sources said the price paid was largely in cash, with some stock incentives for employees of Rockmelt. Rockmelt’s funders included a panoply of big names in venture and also angel investing, such as Accel Partners, Khosla Ventures, Andreessen Horowitz, First Round Capital, Bill Campbell and Ron Conway. But the acquisition does land a gifted tech team at Yahoo, which is in need of more such talent. In the deal, its founders — ex-Netscape engineer Tim Howes and former OpsWare employee Eric Vishria — will become key execs in the effort, with Howes running engineering for all its mobile products and Vishria becoming a VP for media products across Yahoo. 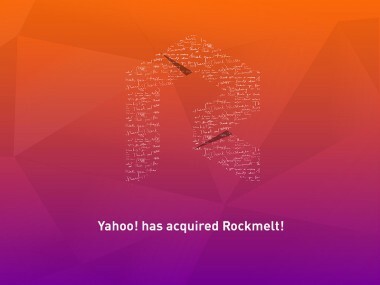 As Mike Isaac just reported, Yahoo announced that it had acquired Rockmelt, a startup which aimed to reinvent the way users browse the Web through a host of social features. “The parallels between Yahoo! and Rockmelt are obvious: we share a common goal to help people discover the best personalized content from around the web,” said Yahoo product heads Mike Kerns and Adam Cahan in a Yahoo blog post. Rockmelt was created by Howes and Vishria and was originally launched an entirely new desktop browser back in 2010, a standalone product to combat the browser kingpins. Rockmelt plans to shut down its existing apps at the end of August, the company said. Presumably, the name will also fade away. That’s a far cry from Rockmelt’s once-lofty ambitions. As it turns out, not so much in the way Rockmelt intended, so it will be interesting to see what Yahoo makes of it next. Until then, it’s more with the new vassals — in this case, the Rockmelt team — taking a forced-funster picture dressed all in purple upon yet another Yahoo acquisition, which now number close to two dozen under startup chomper and Yahoo CEO Marissa Mayer.